I am Ronald Terry Anderson. My grandmother, born Eva Terry, must have been the younger sister of William Henry Edward Terry. Info I have says she was born in 1900, Madison Co., FL ,daughter of Zacharia and Molly (?) Terry and moved to Ray City. Hi Ronald, thanks for sharing this family history. The 1900 and 1910 Census records show your grandmother in Madison County, Fl in the household of her parents, Mary Virginia “Mollie” Pert and Zack T Terry. 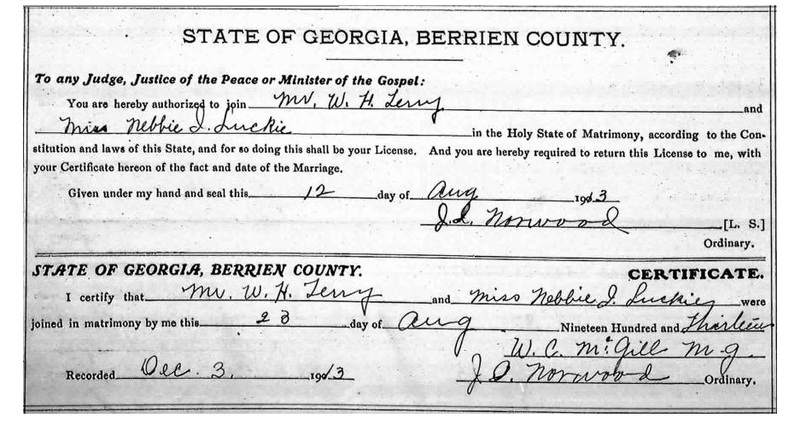 About 1918 your grandmother married Thomas T. Ellis and the couple made their home in Ray City, GA for at least the next couple of decades.